and loved it so much we moved here. From the time that pitchers and catchers report to the days where the MiLB players fill the Carpenter Complex and there’s four or more games going at once. THIS is what we live for. Adam took the mound and pitched against experienced MLB players and acted as if he had been pitching against them for years. It always makes me smile to see a guy who was in Clearwater last summer making a big impression. 2. Watching Chase Utley run. It doesn’t seem like it should be something that stands out. I watched Chase run in base running drills and was blown away. Not only did he not seem to have any pain, he was running better than a LOT of the younger guys. He had great speed and looks in better shape than I think I’ve ever seen him. It was simply amazing and wonderful that he seems to be at his best. 3. 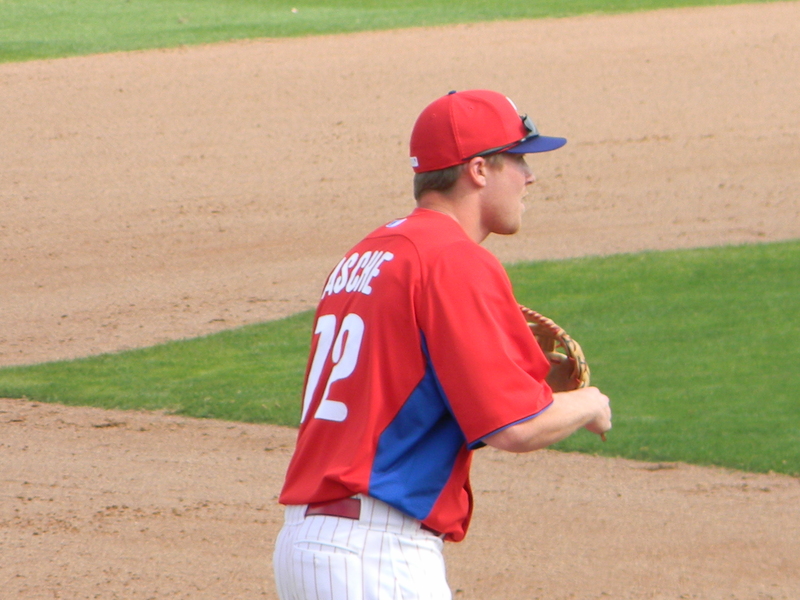 Watching Cody Asche play. Cody is another player who started last season in Clearwater and to see him invited to the MLB camp and playing well is great to see. 4. 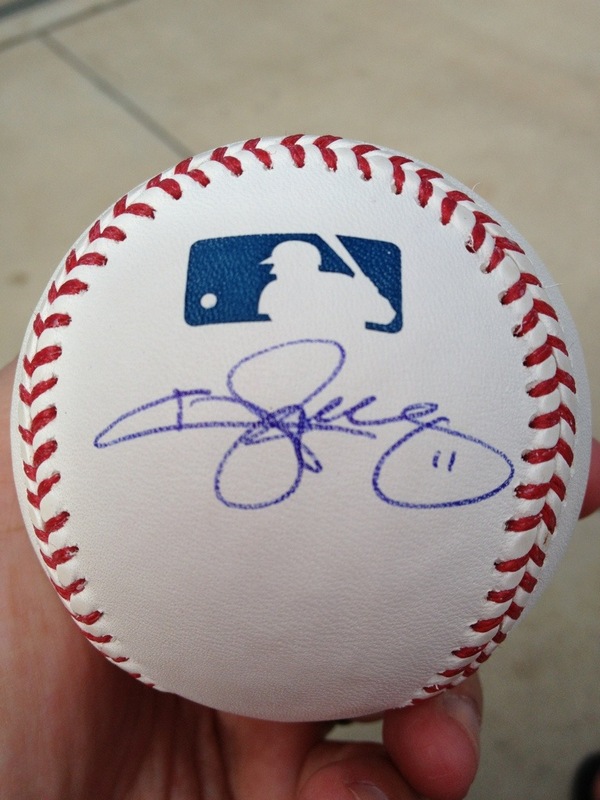 FINALLY getting Jimmy Rollins’ autograph. I’ve been seriously collecting autographs for six years. Until this year I NEVER got Jimmy’s. It’s been killing me. Two days, I missed him by only one or two people. Then the day came and he stopped (after I had told him about trying for six years) and signed my ball, slowly and deliberately. It’s one of the BEST autographs I’ve ever gotten and I cherish it. 5. 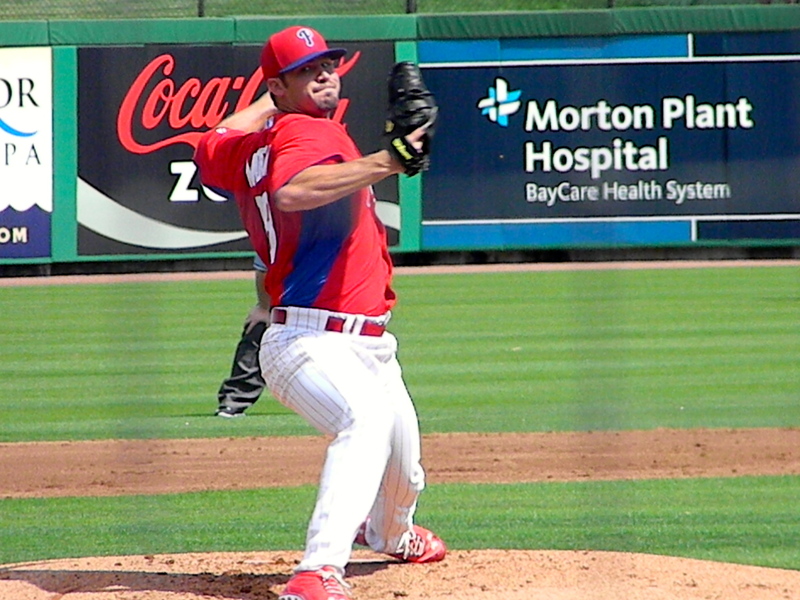 Cole Hamels’ pitching. He’s earned the big contract and the honor of being the opening day pitcher. He’s pitching well and I can’t wait for opening day. 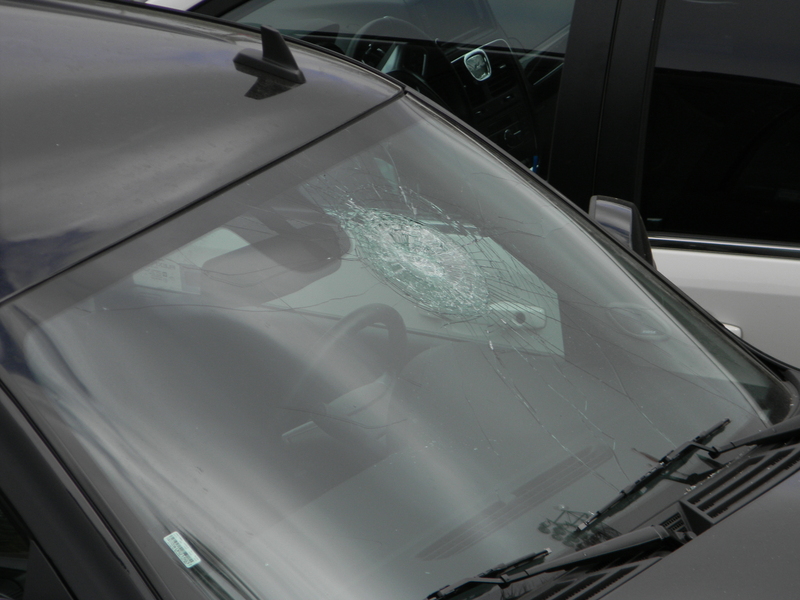 During the opening game, the Astros were taking batting practice and someone nailed a ball that sailed out over the Tiki Bar and landed with a CRASH, right on someone’s windshield. Hope they have insurance! Tomorrow the Phils play the Blue Jays and I’ll be there, though I may freeze as it is expected to be one of the coldest days of the year (though it looks like the earlier forecast of SNOW won’t happen.) They are also calling for drizzle so it may be a miserable day to watch in the stands.